By Singyin Lee in Culture. Updated on December 6, 2018 . We usually don’t write about finance but we do like to indulge a bit in e-commerce and online shopping, and when it comes to e-commerce, you cannot afford to ignore China’s market. Today (Nov 11) is Single’s Day in China, equivalent to Cyber Monday in the US. Scratch that, it’s not equivalent to it, it’s twice as big. Last year, Alibaba made $3 bil within 24 hours on Nov 11 – this year they are expected to pull in $4.9 billion, all in a day’s work. And that’s just Alibaba. Despite the catchphrase "Made in China" being thrown about a lot in jest, perhaps it is time we change our tune. China is an economic force to be reckoned with when it comes to e-commerce. More than 240 million Chinese consumers shop online, and they are expected to spend $265 bil in 2013 – $75 billion more than the 1.3 trillion yuan ($210bil) spent in 2012. Of that sum, Alibaba, the world’s largest e-commerce company handled more than 90%, around 1.1trillion yuan ($180 bil) worth of sales through Taobao and Tmall. That’s more than eBay and Amazon combined. And this is just the start. China’s e-commerce market is predicted to overtake the US in 2015, although some are insisting that it could be sooner (as soon as this year). In the second quarter of 2013, the gross merchandise value (GMV) of China’s e-commerce sector is 437.13 billion yuan ($71.77 billion) up from 300.92 billion yuan ($49.4 bil) from the same quarter a year before. That’s a 45.3% increase in just one year. 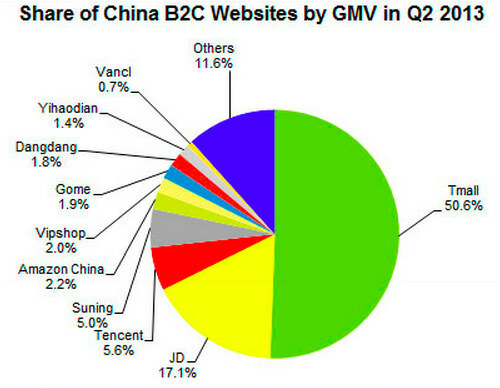 Of the 437.13 bil yuan ($71.77 billion) in the 2nd quarter of 2013, Tmall leads the pack with 50.7% of the market share while JD.com (formerly 360Buy.com) trails at only 17.1%. Tencent and Suning each take 5.6% and 5%. While Amazon reigns supreme globally, in China, Amazon.cn (or more affectionately known as Z.cn) holds 2.2% of the market share, playing nice with VIPShop, Gome, Dangdang, Yihaodian, Vancl and other independent B2C websites. 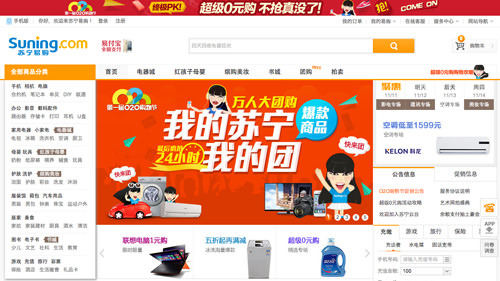 Alibaba had its start in 1999, but the relatively younger Taobao was only founded in 2003. Fighting head-on with eBay China, Taobao conquered the market, while eBay bowed out after a mere 3 years. The popular C2C platform then gave rise to Tmall (Tian mao), a B2C platform to bring in higher-quality merchandise and branded goods to grace Chinese shoppers. AliWangWang – instant messenger, which allow direct communication between buyer and seller, to ask for specifics/details and available stock. Alipay – an Escrow payment system. It has more than 180 financial partners and trades in 15 foreign currencies. eTao – an independent search engine to help shoppers compare prices across multiple e-commerce platforms, not just Taobao’s prices. Sina Weibo – Alibaba recently invested $500 mil into the already popular microblogging site to allow users to link their Sina accounts with Taobao accounts, possibly facilitating purchases. Rookie Network – A same-day delivery system to counter logistics problems it has been facing, is being setup. Alibaba is pumping $16 billion to develop this. Taobao.com is currently the 13th most visited website on a global scale, as ranked by Alexa. It is a self-sustaining ecosystem in itself, with more than 800 million products listed for purchase. The main site (for mainland China) has sister sites to cater to visitors from Hong Kong, Taiwan, Southeast Asia and other regions. If you don’t speak the language, you can bank on the middlemen or Taobao agents to manage the shopping for you. Additionally, Taobao has recently acquired an office in Singapore, and launched a package forwarding service for Malaysia and Singapore. 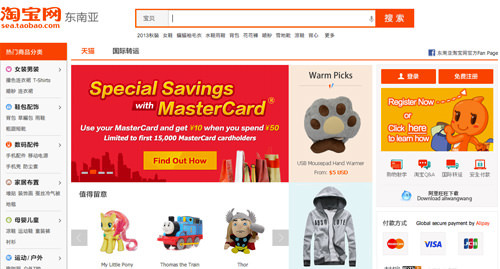 While Taobao is a C2C platform, with offerings that range from the common – clothing for men, women and kids, digital devices and accessories – to the less than common ones – wedding gowns, invites and door gifts (and even a lamborghini once), Tmall, on the other hand, features more high-end products (and authenticity) on a B2C business model. You can find jewelry, lingerie, handbags, premium watches, digital devices and even luxury cars sold on Tmall. 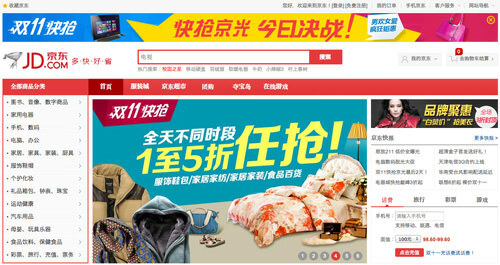 JD.com – Formerly known as 360Buy.com (before March 2013), Jingdong Mall shifted its focus from eletronics and home appliances to books, clothing and a full online travel service. It also has an extension for courture brands called 360Top.com. After letting go of Alipay in 2011, it is in the midst of developing its own payment system to facilitate payment. It handles more than half a million orders a day, features 10,000 merchants and is has 100 million pageviews per day. It ranks 24th in China. Tencent.com – Tencent which owns paipai.com and buy.qq.com, has also purchased 51Buy.com, a platform for consumer electronics with its own logistic network. Good logistics and delivery systems spell further expansion as online shopping spreads out and advances to smaller towns and cities, but its strength lies in social media and the power of word-of-mouth. It ranks 899 in China. 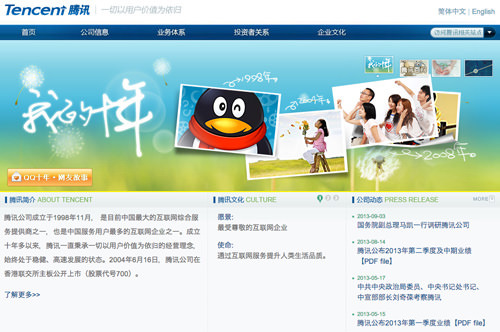 Suning.com – Suning was primarily the leading home appliance retailer in China when it ventured into ecommerce. After acquiring RedBaby.com.cn for $66 mil in 2012, Suning expanded into the hybrid business, following the footsteps of Jingdong. However, it continues to operate both online and offline businesses (it has more than 1500 stores nationwide) after unifying its pricing policy across both environments. Alexa ranks it at 455 in China. Yihaodian – The largest food e-tailer in China made headlines in 2012 when it announced that it is opening 1000 virtual stores all over China. Shoppers can use Augmented Reality to shop in these virtual stores, using their smartphones. Walmart owns 51% of Yihaodian. The company handles more than 1000 orders for fresh food daily, and operates 390 stores in 150 cities all over China. The site features 2 million products now, and has 10 million visits a day. It ranks 472 in China. Other notable names in the industries include: Amazon.cn, Dangdang.com, Vancl.com (China’s biggest clothing e-tailer) VIPShop (Jiapin) and Gome. At the rate that the market is booming, we may be seeing changes in the top 10 list in 2014. 1. Clean and minimalistic website designs preferred in the US and elsewhere are not received well by Chinese shoppers, who prefer a crowded and compact website, which gives them the impression of a "high-energy shopping atmosphere". 2. Shoppers also prefer to open up links in new windows for faster comparison of prices rather than switching back and forth between pages. 3. Chinese shoppers are extremely price sensitive – sales, deals and promotions are great crowd pullers, and there is little to no brand loyalty. The ‘time is money’ concept hasn’t really caught on, and buyers rarely pay the extra to get their wares to arrive faster. 4. Logistics is essential for e-commerce, and third-party delivery systems have been found to be lacking. After finding that more than 60% of customer complaints received were related to problems in delivery, yihaodian responded by building their own last-mile delivery system. 5. Yihaodian also recognizes the impact social networking and mobile commerce has in online shopping. Word-of-mouth and personal recommendations are still the best way to ensure the spread of a brand. 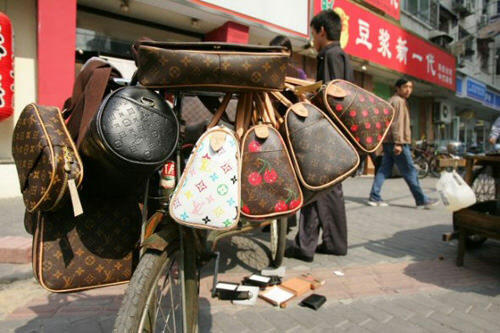 The industry still faces a few persisting problems, one of the biggest is counterfeit goods. Piracy has been plaguing Taobao and Alibaba.com for years. iPads bought from Alibaba may turn up fake; ideas were copied off Etsy then sold (in bulk) on Alibaba, just to name a few. The fight against counterfeit goods is costing Alibaba in the billions but the commitment to fight this is there, pending the company’s IPO by end of this year or by 2014. 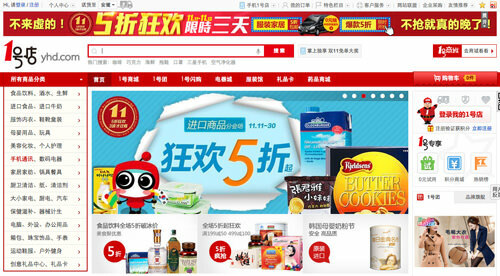 Chinese shoppers understandably prefer to shop for foreign brands when it comes to infant formula and cosmetics products, for fear of accidentally purchasing fakes, yet they still buy from these e-commerce sites because the price is (so very) right. Inside China, the next focus is in conquering m-commerce. Read more about how m-commerce is going to reshape China’s retail space in this article here and why Jack Ma, CEO of Alibaba predicts that "Taobao Mobile will outperform Taobao". Over 40% of current mobile internet usage is already directed at mobile-commerce in China and Alibaba is showing interest ($50 mil worth) in Quixey, a Silicon-valley mobile search engine app that lets you search for apps without knowing its name. Nowadays, it isn’t enough that Facebook and Google wants to buy your app, perhaps you should aim to build one Alibaba is interested in.